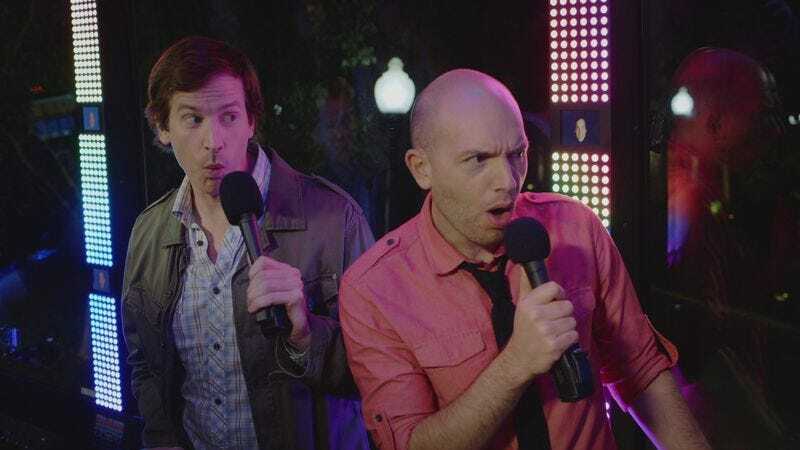 According to Deadline, Rob Huebel and Paul Scheer are teaming up again for a scripted satirical comedy about ridesharing called Drive Share. Huebel and Scheer are the comedy duo behind Crash Test, which started as an improv show at the Upright Citizens Brigade theater in Los Angeles and eventually became a series for Comedy Central in which a bunch of comedians piled onto a bus for some bits. This time around, there will be no bits on a bus, but there will be a whole lot of sharing rides: The series will follow drivers as they shuttle interesting characters all over town and will play into the kind of bizarre but relatable scenarios that often come up during Uber rides, which are rife with accidental comedy. Hopefully the series will also touch on the specific peculiarities of Uber pool rides. The digital TV studio Insurrection Media has ordered 10 half-hour episodes of Drive Share, and the series will air in shorter segments on Verizon Hearst Media Partners’ new millennial-baiting digital video channel Seriously.TV. Insurrection Media will then distribute the episodes in half-hour form at a later time. Jonathan Stern and Keith Quinn—who both know a thing or two about satire, having produced the brilliant Bachelor-skewering short-form comedy Burning Love—will executive produce this project over their overall comedy production deal with Insurrection Media. “In this crowded TV landscape I believe this is the only show that will prove to make a difference in the world,” Scheer says. “We’ve all had hundreds of hilarious, bizarre or awkward rides since these services started up…all we did was write them down!” Huebel adds. Drive Share is expected to premiere at the end of 2016.